Tim Fortugno picked up his first major league win in 1992 in grand style, according to The Associated Press, by throwing a complete game shutout. "This makes it all worthwhile," Fortugno told The AP afterward. "I feel real good inside." For Fortugno, "it all" included a lot. He made his debut days before that big win at the age of 30, having started his pro career only six years earlier. He'd also given up on the game once - and been part of a trade that included 144 baseballs going the other way. 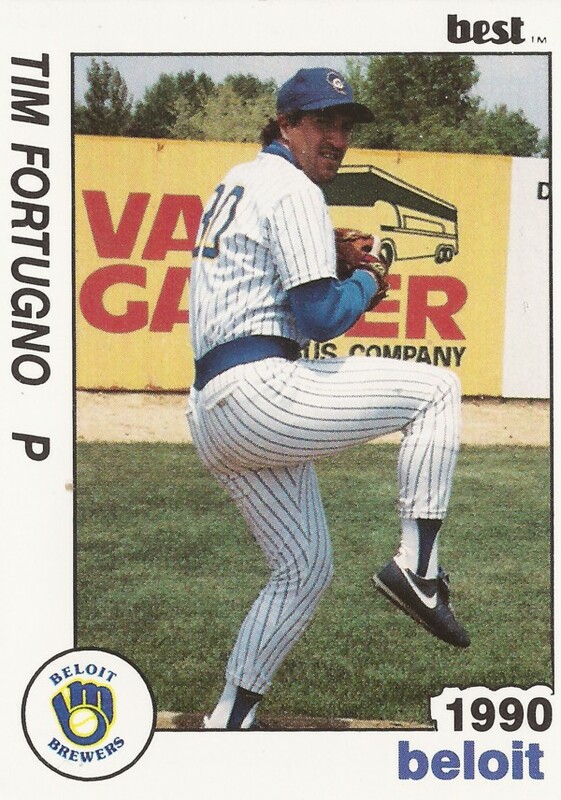 Fortugno went on to see time in three major league seasons, where he got into 76 games, gave up George Brett's 3,000th career hit - and then picked him off first. Fortugno's career began in 1986, signed by the Mariners as a free agent out of Southern California College and Golden West College. Coming out of Uxbridge High School in Massachusets, though, Fortugno pursued a regular job for his family, not baseball, according to The Orange County Register years later. A game of catch with a tennis ball while working construction led him to return to the game, and to college, The Register wrote. He caught on in college and drew the attention of scouts. Fortugno went 9-2, struck out 153 in 92 innings and made second-team NAIA All-America. In June 1986, Fortugno signed with the Mariners. Fortugno played that first year as a 24-year-old between short-season Bellingham and single-A Wausau. He posted a 2.31 ERA over 25 outings. He then played 1987 at single-A Salinas and moved to the Phillies and single-A Clearwater and AA Reading for 1988. He had a 3.76 ERA between Reading and Clearwater. The Phillies then released him to start 1989. Unable to directly catch on with an organization, Fortugno continued with independent Reno. After a brief stint there, the Brewers showed interest. That's where the baseballs come in. Negotiations stalled, the Reno general manager finally asked the Brewers to toss in 12 dozen baseballs along with the $2,500 cash, according to The Los Angeles Times. "I don't care what they got for me--baseballs, bats, uniforms," Fortugno told The Times that summer. "My main objective when I went to Reno was to be seen (by a major league team). And I was going to go with the first offer." Fortugno then played at single-A Stockton and AA El Paso. He split 1990 between El Paso and single-A Beloit. He made AAA Denver in 1991 and then, after the Angels took him in the Rule 5 draft, he made California. Fortugno got into 14 games for the Angels that summer, starting five. In late-September, Fortugno gave up Brett's 3,000th hit on a ball that took a bad hop. "I suppose 10 or 15 years from now I'll think it was an exciting moment," Fortugno told UPI. "But not right now. I wanted to be known as the guy who stopped him. But you have to have a lot of respect for him." After a celebration, Fortugno threw over to first and caught the future Hall of Famer off base, picking him off. 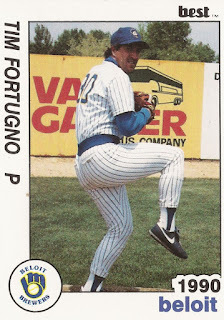 Fortugno spent 1993 with the Expos at AAA Ottawa. He then returned to the majors for 1994 with the Reds. He got into 25 games, with a 4.20 ERA. His final major league time came in 1995, with 37 games for the White Sox. Fortugno played two more seasons in the minors, ending his career. He has continued in the game as a scout. He's scouted for the Rangers. In 2015, he worked with the Mets.